How's the view from your new glass house? As if we didn't want Alex Rodriguez here in our town. A-Rod, A-Fraud, A-Roid, and so on. Of course, we wanted him in the worst way when he was available after the 2003 season. We felt betrayed by the Texas Rangers, by Major League Baseball, by his agent, so betrayed that losing out on free agent Mark Teixeira last month to the Yankees hardly hurt at all. It was just another one of those betrayals. Now, catching enemy superheroes from the dark side is especially rewarding. It’s like hearing that the neighbor you hate has found termites in his wall. Guess what? The termites could be in your walls next. To be blunt, how many Red Sox on the 2004 World Series championship team were juicing? Would it matter to you if we found out the way we found out last weekend about A-Rod? Remember, he was close to being in a Boston uniform for the 2004 season. What if we discovered that Johnny Damon or Mark Bellhorn or David Ortiz or Pedro Martinez or Curt Schilling was on the same list of subjects of random testing back in 2003 and came up positive for steroids? I guess the point is that you have to get over it. All hands on deck! Pass the needles and bless them all. Who wouldn’t take performance-enhancing drugs if they were not against MLB rules? Anybody who didn’t do it would be kind of stupid, wouldn’t he? You wouldn’t necessarily want your players on this list. But at least the people on the list wanted to be better at their craft. How else can you look at it? You can call them cheaters. Does that make them feel worse? A-Rod was a cheater. Does that make you feel better? Remember the glass house you now live in. The day will come when so-and-so of the Boston Red Sox will be front and center on some such list. This, I think, is equally important: We definitely need more information. It’s a situation not unlike that of Eliot Spitzer, alias “Client No. 9.” Who were the first eight clients? Who was “Client No. 1” on that list? In the case of A-Rod and Major League Baseball, who were the other 103 players on the list who tested positive? You need to know that. Baseball needs to be held accountable for this. Not just one notable name out of 104. Who are the other 103? We should all demand to know. Why just Alex Rodriguez? Because he’s more interesting, has more money, and is a lightning rod? He gets more attention? “A-Fraud,” as Joe Torre writes in his new book. Where were the Yankees’ manager and general manager and owner when this was all happening? You must know that the business of Major League Baseball is a small, closed society. Everyone knows what’s going on. They know who is in and who is out, and how to lie. And how to deny when the Grim Reaper, aka a reporter, comes calling. For his part, A-Rod decided not to take that approach. The Yankees third baseman admitted during an interview with ESPN’s Peter Gammons that aired Monday night that he used performance-enhancing drugs from 2001 to 2003 while a member of the Texas Rangers. A-Rod’s admission capped a wild media feeding frenzy that began when Sports Illustrated reported on its website on Saturday that he was on the list of 104 players who tested positive for performance-enhancing drugs in 2003 during Major League Baseball’s survey testing. That survey, which did not subject the players involved to discipline, resulted in the institution of a drug policy the following season. It was supposed to be confidential. A-Rod hit 156 home runs from 2001 to 2003, including 57 in 2002. The following year, during which he reportedly tested positive for Primobolan and testosterone, A-Rod won the first of his three American League Most Valuable Player awards. The Rangers, after futile negotiations with the Red Sox to work out a trade for A-Rod during that off-season, shipped him to the Yankees for Alfonso Soriano. During his five seasons in New York, A-Rod added a pair of MVP awards, in 2005 and 2007. Without ever playing another game, he would have been a shoo-in for induction into the Hall of Fame when the time came. What now? First of all, I don’t know how you can have a Hall of Fame without Pete Rose, Barry Bonds, Roger Clemens, and Alex Rodriguez. It’s an Almost Hall of Fame. These guys belong, but I’ll bet the writers won’t elect them. There needs to be a Forgiveness Room in Cooperstown with a plaque that reads, “These guys have sinned, but we forgive them. They deserve to be here, and we need to respect them and honor them as players.” As we travel further down the road, that room would have to be expanded considerably. A-Rod is far from the last player who will be asking for forgiveness when the time is right. There will be plenty of others. "As if we didn't want Alex Rodriguez here in our town. A-Rod, A-Fraud, A-Roid, and so on. Of course, we wanted him in the worst way when he was available after the 2003 season." Regardless of his numbers, I never wanted him to land in Boston. I was happy to see the deal fall through. I never liked him as a player and he has only confirmed this with his problems in the public and clubhouse since. Truly the biggest glass house here is, "MLB Brass." In any scandle the person most guilty is the person at the top that should have held these players accountable in a much more timely manner (like in 1999.) I think if your looking for someone who is the end all to blame its MLB Operations. Screw ARoid.... this all couldnt have happened to a "nicer" guy. Hope he has a fun year with this all circling about him. BTW... Do you really believe this only happened in TX between 01-03? If you believe this you are being completely gullable and naive. Whew, the current batch of justification articles on this subject is a little depressing. I understand the unfortunate position we as fans are in as we await the eventual Sox Player on the list, but it doesn't make it right. It doesn't. I will never fall into the little child excuse of, "everyone else did it, Mommy." Let's be candid here folks. Why was A-Roid's name the ONLY one leaked from the 104-name list?! One must wonder if the Powers That Be are not only after A-Roid, but after one Scott Boras. Do you think Man Ram's continued state of limbo is a coincidence?! The Teixeira-to-NY signing could very well have been the straw that broke the camel's back. The SOX surely hads a few players on 'the list' and I hope we all expect that. These guys did and do take all sorts of supplements in an atmposphere where surgery, rahab, pills and injections are common. While some of them were and are illegal, no one was ever charged with this crime. It was more like speeding. Selig and the Brass did not handle it at all, it handled them. And, for the record, many of us were totally against getting A-rod and for players testifying before congress. Should have been Bud and his team. I'm with Andy (posting No. 2) - I NEVER wanted A-Rod on the Sox. By that time he had been exposed as a crybaby prima-donna (or Pre-Madonna). He wanted to leave Texas for a chance to win, when he had abandoned a very good team in Seattle for the almighty dollar. As for steroids, the media needs to get off its high horse. Beat writers and other had to strongly suspect (if not know) about performance enhancers and said nothing, especially during the McGwire/Sosa/Bonds HR race. The press was/is in so tight with MLB that it seemed afraid to write about performance enhancers. Obviously, the fans don't care that much - we just want to see the games and hope that everyone's playing by the rules. And legally. I'm waiting for Schilling's book on this thing. No doubt he would blow the whistle after his Sox and broadcast days are over. Guys like Schilling should be able to tell their side of things if they are clean. I understand the old boy network and saying it was the culture, etc.. but SOME great players must have been clean...and if I was one of them then I would want everyone to know. I think all bets are off at this point and it is being brushed off as THAT era, so if I'm clean I should be able to say so...and I would encourage others to back me up and come clean themselves. The first guy that comes forward without being implicated prior should be immortalized...and will forever be a fan favorite! Who's gonna be the real man...not an Arod admission after the fact! It's like committing a crime and then admitting to it after they find your finger prints on the gun?!?! Of course we wanted Arod but we didn't get him and now we're glad. Not sure how you can accuse Red Sox fans of living in glass houses. Why don't you wait until a red sox player is a confirmed cheat and see how Sox fans react. Yes we're afraid who else might be on the list but that's the point, the bums who get caught have created doubt towards every high acheiver. Arod is a fraud and proves it every chance he gets. None of them are going to the hall of fame and they don't belong. 9 more years of the curse of Arod. The point isn't that he did it and none of our guys did. The point is that he came out and adamantly denied doing so, and spoke out on how juicing is wrong, and so on. If any of our guys juiced, they never spoke against it. So they're crime is juicing, but not juicing and lying. In fact, Ortiz has had comments that are somewhat of a tacit admission, saying "I don't know if I drank something in my youth," and only spoke of how you have to be careful. So if he's on that list of 104, no one can cry foul that he lied about doing steroids. Rodriguez spoke out against its use on his own power (and while trying to claim a squeaky-clean image). 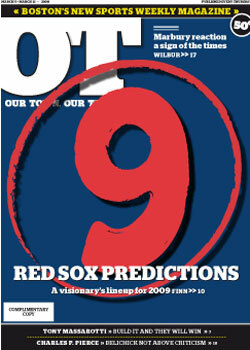 If we find out Papi and others were juiced in 2004, then the Sox' first title since 1918 should have asterix next to it. Fair's fair. But I don't buy the everybody-was-doing-it-loosey-goosey line,. If 104 tested positive, a whole bunch more didn't. They are the heroes and hall of famers, not the cheaters. Thanks Lobel. Another article of many that speaks to how pathetic, hypocritical, and soulless the hate for A-Rod is. As a Red Sox fan I am disgusted by the glee with which some idiot Red Sox fans are taking on this issue. It's bad for baseball and while I am not looking forward to the naming of the other 103, the silver lining is that it may shut up some of the iidots screaming from the rooftops. I didn't want him in 03 so speak for yourself you drunken idiot! How many passed? What was the percentage? In hindsight, Sox won due to chemistry. A-Rod would not have fit in. Create a post steroids record book. Scientists are going to continue to find ways to beat testing, either by masking or coming up with new drugs. Place asterisks next to the players who have been caught. MLB did have a rule against steroids without a prescription since 1991. Bob Lobel and whoever pretends to be a journalist writing about sports should research before writing stuff. "Why just Alex Rodriguez?" a few guys ask. Well we know A-Rod was LYING on TV about it and a few people knew for a fact he was. Maybe the 103 aren't liars just cheaters. Part and parcel of playing any professional sport is fame. Without it, the paychecks would not be what they are today. You have to accept the consequences of fame if you seek the rewards. But that aside, sports are only games. Games with rules that are an explicit social contract. Through games, children learn some aspects on how to conduct themselves as adults such as meaningful cooperation and the concept of mutual benefit ; how to be magnanimous in victory and accept that from defeat you can better yourself . I could go on . . . So, if you accept that professional sports is the pinnacle achievement, then you explicitly accept the all that sports encompass. This includes conducting yourself in a manner consistent with the explicit social contract of sports and, like it or not, being a role model. Steroid users violate the social contract of the game and they violate the law. Both desecrate the principles - some say the uniquely American principles - of fair play. What have you been taking for steroids?? If you are taking steroids (not something that is natural) to get an edge, advantage, whatever... it's cheating. If there are Red Sox from the 2004 team that used steroids, then they are cheaters and should be branded as so. This has got to stop and the only way to do this is to make examples of the biggest names. Then maybe these cheaters will eventually get it! No A-Rod, Clemens, Sosa, Bonds, etc.. in the Hall? Sounds good to me. Makes what Shoeless Joe did (or did not do) pretty petty compared to these cheats. Bob, get with it! Man you are slipping. Must be the age thing. Juiced players. Drunk sports casters, what's the difference? Look even if these HOF players did roids, they still played great ball. You can't deny what they accomplished. So as a means of recognizing this, why not create an asterisk wing to the hall. It'll state these guys put up great numbers, but they had help unlike the guy who went about it the right way. Furthermore, only accept contributions from the asterisk players to build and fund this section of the hall, thereby allowing enshrinement at "their “cost! POSTING 17 ISRIGHT. AROD NEVER WOULD HAVE FIT IN IN BOSTON. HE DESERVES EVERYTHING COMING HIS WAY. HE HAS BEEM LIVING A LIE FOR FIVE YEARS BUT SURELY HAD NO PROBLEM CASHING NEW YORKS CHECKS. You guys who say you never wanted him are lying, come on.